Well, top o’ the mornin’ to ya! Happy St. Patrick’s day to everyone, whether you’re Irish or just Irish for a day. 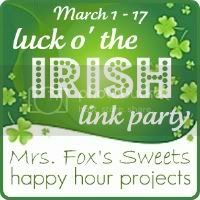 :) Mrs. Fox’s Sweets and I have been running a Luck o’ the Irish link party for a couple weeks, collecting your crafts and recipes in honor of the day! I have a few I’d like to highlight (and stop by Mrs. Fox’s Sweets to see what she is featuring, as well)! You may grab whichever feature button you like – the Happy Hour feature or the Luck o’ the Irish button above for your hall of fame. Thanks to everyone who has shared their great ideas so far, and there’s still some time left today to add your post to the collection below! Or just take a look if you’re looking for a last-minute recipe or craft today! Thanks so much for featuring my onesie! It totally makes my weekend! 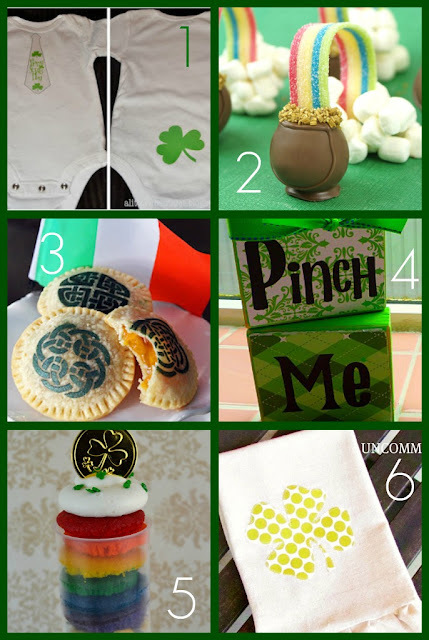 Happy St. Patty's Day!